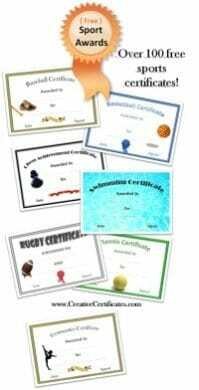 Free printable sports certificates and awards for a variety of sports. You can add a photo of the recipient or the team before you print. If you would like another sports certificate template, please feel free to post a comment and we will try and add it to the collection. In addition to the printable certificates above, you can also use our certificate maker to make your own sports award certificates. You can upload an image related to the relevant sport or a picture of the recipient or the team. To add a picture to any certificate just click on the image icon. What can these free printable sport templates be used for?